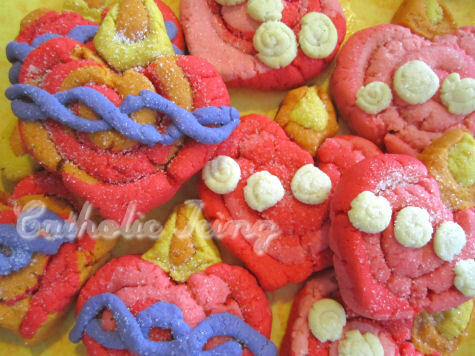 Don’t let the name of these cookies scare you off- these are 100% edible cookies! 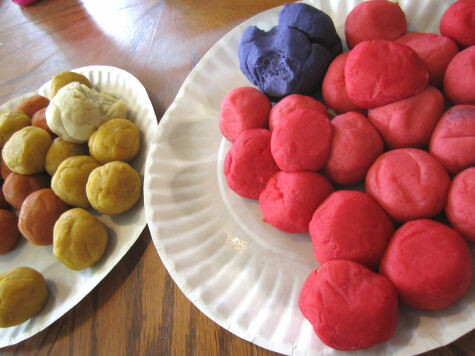 They just look like play doh, and you get to play with them like you’re a little kid again. 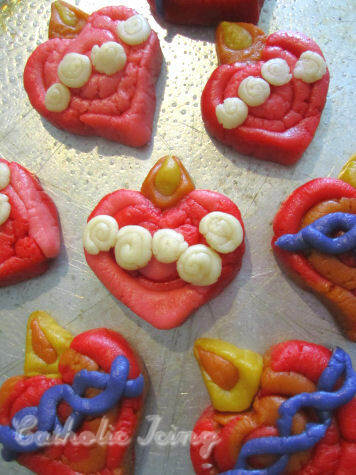 And let me tell ya- your kids are gunna LOVE making these cookies! First you’ll need to make your dough. 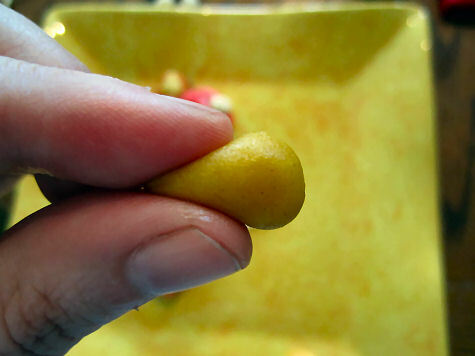 In my opinion, this is the least fun part. If you’re in a patient mood, allow your toddler to “help” you. 😉 Here are the ingredients. 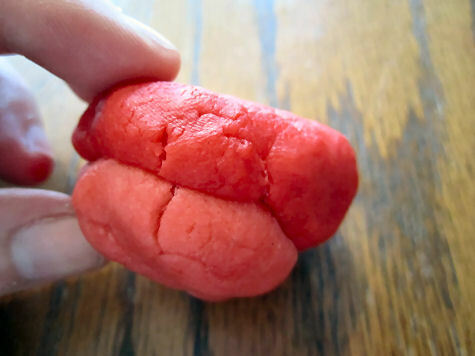 I went ahead and doubled the recipe for you to make it “big family friendly”, which will make about 25 heart shaped play doh cookies. Start by creaming the butter, sugar, and cream cheese. Then add the eggs and almond extract. Stir until smooth. In a separate bowl mix dry ingredients, and add to the butter mixture. Color as desired and roll into 2 inch balls. Cover and refrigerate for 2+ hours. 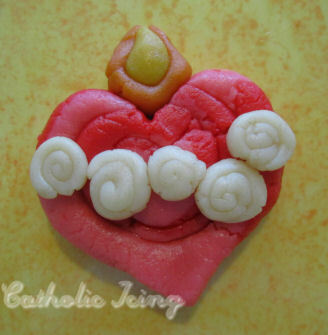 When firm, shape as desired (directions below for how to make Sacred and Immaculate Heart cookies). Preheat oven to 350. Sprinkle the top of each cookie with white sugar, and cook for 12-15 minutes or until cookies begin to brown on edges. For the sacred heart cookies, I divided my dough in quarters. I made one quarter red, one quarter pink, split one quarter between yellow and orange, and split the last quarter to make purple and left the last eighth white. Begin by sticking 2 colors together. 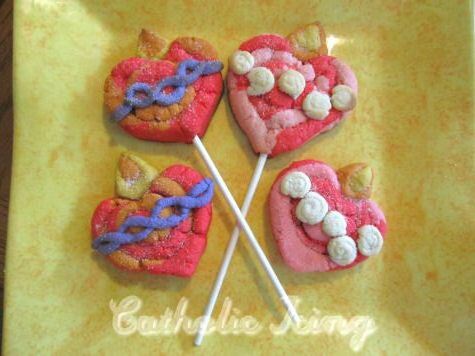 For my Sacred Heart cookies I used red and orange, and for my Immaculate Heart cookies I used red and pink. Roll this into a long coil. My dough did crack when I was doing this. You can stick it back together if it brakes. I found it was best to start in the middle and roll towards the edges. 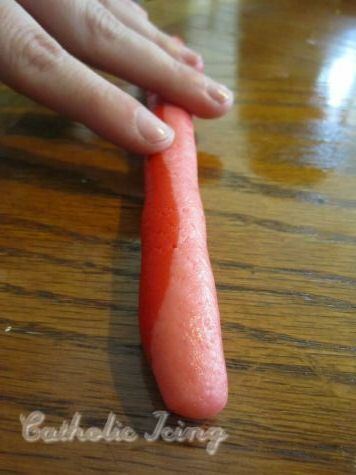 It also seemed to work better if we rolled using our finger tips rather than the entire palm of our hands. 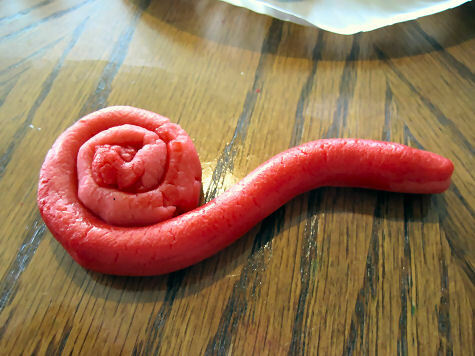 Then roll the coil into a spiral circle. 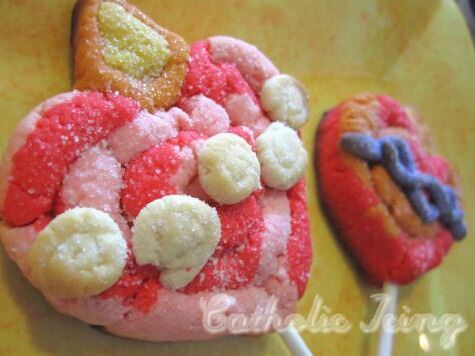 Use the end of a butter knife to dent a top in for the heart shape, and then pinch the bottom of the cookie to complete the heart. 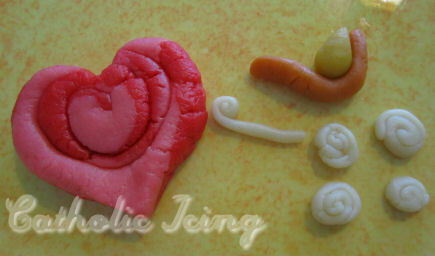 Here are the pieces I used to put together Immaculate Heart Cookies. top and is surrounded by roses). 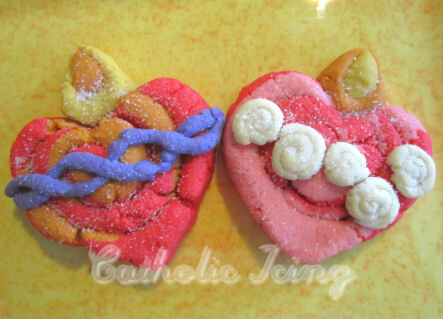 Here are the needed pieces for the Sacred Heart Cookies. of the top, but it is surrounded by a crown of thorns). 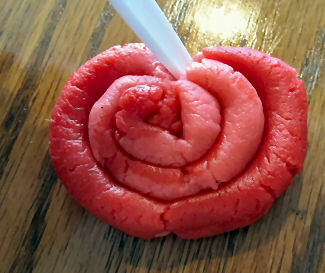 You can shape the flames by making the dough into a ball, and then pinching the end to a point. 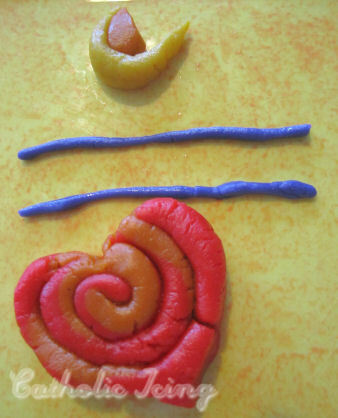 Wrap an orange coil around the yellow shape to complete the flame. I found that the crown of thorns and roses stuck just fine, but the flames will fall off after the cookies are baked if you don’t stick them on really well. 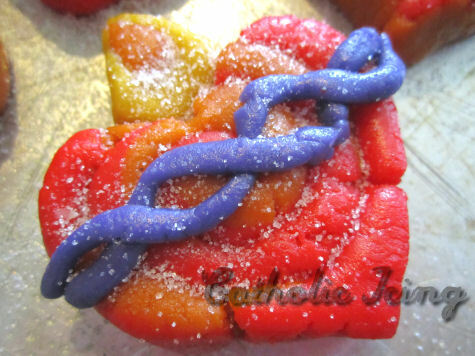 the perfect cookies for a Catholic bake sale! 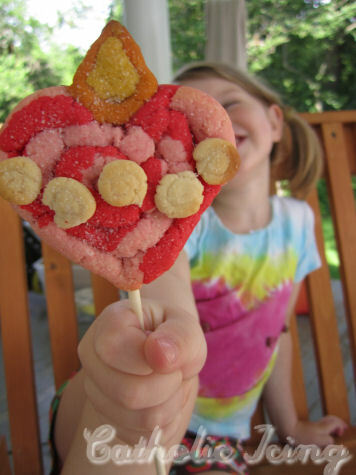 And what isn’t cuter on a stick? 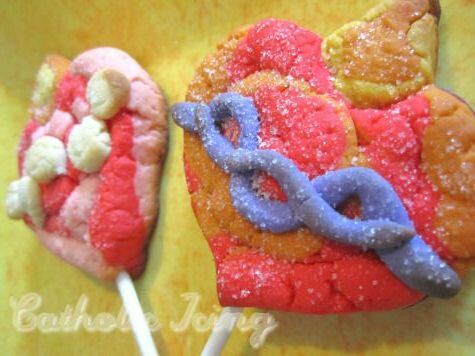 Lolipop cookies are just adorable! Most Sacred Heart of Jesus, have mercy on us. Immaculate Heart of Mary,pray for us. 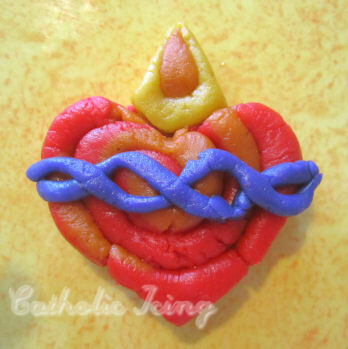 Round up of Sacred and Immaculate Heart crafts, printables, cakes, and more! Hi Lacey i have subscribed but unfortunately am unable to print the valentine chain bible verses. Made these tonight for the feast of the Immculate Heart of Mary tomorrow! They turned out beautiful and tasted great also! (I even used 1/2 c. Less of sugar but did sprinkle sugar on top & they were perfect).